Just wanted to get another set of eyes on this. I'm taking over maintaining my pool and am going to go the BBB route. The pool has been losing all chlorine in less than a week, so I'm starting a daily routine to keep an eye on the chemicals. Here are my first readings with the FAS-DPD. I'm estimating the pool capacity around 48,000 gallons. PH - 7.8 - this was after adding some acid on Monday, looks like I have a little way to go still? CSI - .31 Does this matter? It looks like lowering pH will help, correct? It's sand filtrated, has one bottom drain and one skimmer. Plaster pool. You're obviously not using FAS-DPD. Most likely just DPD or you could read higher than 10ppm. .31 CSI isn't very high. You could lower your pH a little if it's bothering you but I'd just leave it alone and see if it rises on it's own then lower it if needed. What kit are you using? It looks like an OTO test (DPD usually maxes out at 5) to me; is it the yellow test in the TF-100? I asked for the FAS-DPD at Leslie's, he told me this was the right kit. It says "Total Poolcare DPD Test Kit". There's a Taylor instruction sheet inside. I can't find any numbers that match the units you mention. That's not the FAS-DPD kit...typical leslie's bait and switch. Leslie's does sell the FAS-DPD, but is usually not found in stores and is available on their website. The FAS-DPD test in the Taylor K2006 or TF100 or the Leslie's rebranded K2006 found here can measure FC up to 50ppm. Hate to say this, but they sold you the DPD kit. Right now it's OK with me. I can at least tell if I have ENOUGH FC in the system. There is a commercial Leslie's by the house, I went by there to get the FAS-DPD but they closed before I could get there. Guess since they mainly service the industry, they close at 5:00. We've seen that happen a bunch of times. People ask for the FAS-DPD and are sold the DPD. They tell you it's the same but it's not. I don't know if they truly believe they're the same and just don't know any different or of they're just selling you the one they have in stock and hoping you won't know the difference. Can you tell me what I"m missing, other than not being able to show concentrations over 10 for FC? That's it...which is very useful when trying to shock. Right now all you know is that your FC is +10...could be 11 and it could be 30. You can get just the FAS-DPD test here since the rest of your DPD test kit is OK. This kit from TFTtestkits uses Taylor reagents and is similar to Taylor's K-1515-A but has 267% more volume of reagents (2 ounces vs. 0.75 ounces). It can not only test up to 50 ppm FC, but can very accurately determine FC and CC to within 0.2 ppm when using a 25 ml sample (or 0.5 ppm when using a 10 ml sample). A demo of this test is shown here where you can see you just count the drops until the sample turns from pink to clear. No guesswork nor trying to match to a color standard. Thank you Chem Geek, will do. Appreciated!!! I have a mustard algae problem that I've not been able to clear. It's time for me to go through the shock process tonight. The pool was at zero chlorine when I bought the house (about a month ago) and although I've been keeping the FC around 4-5 daily, it simply won't clear. I'm torn between using calcium hypochlorite or bleach to remedy the problem. If I use 6% bleach, it's going to take me about 26 jugs of clorox to bring the pool up to shock levels. If I use the calcium hypo I only need around 12 lbs of the 65% stuff. Given my current CH of 300, would it be a mistake to use the calcium hypochlorite? I did get my kit from tftestkits, and will be using it to monitor the shock process. With CYA at 50, you'll want to target a 5-6 minimum FC, meaning if you are only adding chlorine on a weekly basis you should be raising your FC much higher as you'll likely be losing 2-3ppm per day. On your specific question though...given the size of you're pool you can go ahead and use 13lbs of 73% cal-hypo to raise FC to around 28ppm (48k gal pool, right?) and then use bleach to maintain shock level until you are done shocking. MA is very stuborn and will likely require you to hold that shock level for a few days, with vigourous brushing, and go ahead and dump all pool toys, poles etc in the water too so that any algae spores on such equipment is also killed. 13 lbs of calhypo should only raise your CH by 20 or so ppm. I typically add chlorine on a daily or every other day basis. I found that the pool would lose all chlorine in less than a week with the temperatures we were having when I first moved in (over 100 degrees). We are still staying in the 90+ degree range, so I still try to check every day, and at a minimum every other day. I currently have a pool leak that's costing me about 3" a day in water (fixing this next week) so CYA is staying pretty stable even with a couple of floaters with tabs. Very interesting your given solution, that's exactly what I just told my wife I was going to do. I was thinking of using the cal-hypo to shock and clorox to maintain. Thank you in regards to the pool toys and tools, I would not have thought to do that. 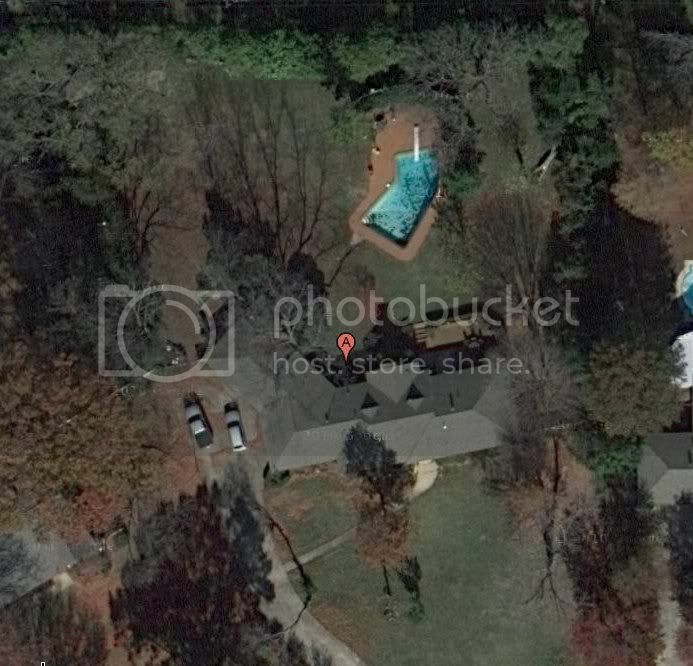 It's possible my pool is over 50k gallons. I still haven't gotten a really good estimate. I'm going to try to reverse engineer the numbers tonight after I add the cal-hypo. Ok I miscalculated due to pool size being incorrect. I overshot and hit 32 ppm. Am I still ok? This is measured after circulating for an hour while brushing the pool. Looks like my pool is 44,0000 gallons. Water is now very white and translucent. Can't see the third step. Not a problem at all...overshooting by 5 even 10 ppm is not a big deal....extended exposure to high FC is not ok, but a day or even two is OK. Cool. I'm sure it'll drop fast. At least now I probably have a more accurate pool size than before. Another thing that threw me is I calculated 65% FC instead of 73%, oops. The ad for Leslie's said 65%, measured FC then checked the container... Learned to check container first tonight. It isn't dropping as fast as I thought it might. It dropped only 2ppm to 30ppm last night. Water still milky white. I did notice pump pressure is up a couple of psi. That's a good thing, if it's somewhat cloudy and the hard and fast shock has killed off the organics, you won't see FC droping rapidly. 2-3ppm per day seems to be the avg. Just keep the pump running and make sure to check the filter psi to ensure it doesn;t get to dirty filtering the dead algae.